As much of the nation deals with the effects of opioid addiction and overuse, some states are attempting to hold the makers of these drugs accountable. Once again, Purdue Pharma, the company behind OxyContin and other opioid painkillers, finds itself in the crosshairs of allegations that it has continued to contribute to this epidemic by deceiving patients and physicians about the safety and efficacy of these drugs. The latest legal action comes from New Hampshire, where Deputy Attorney General Ann Rice filed a lawsuit [PDF] this week in Merrimack County (NH) Superior Court against Purdue, alleging multiple violations of New Hampshire consumer protection statutes, Medicaid fraud, unjust enrichment, negligent misrepresentation, and creating a public nuisance. Purdue launched OxyContin in the mid-1990s, and one of the primary selling points of the new painkiller was that a single dose of Oxy lasted 12 hours, “providing smooth and sustained pain control all day and all night,” per the company’s own marketing materials. The hope presented by the drug was that people with chronic pain could now use an opioid with lower risk for abuse or addiction. But there were numerous problems with this claim of long-lasting effectiveness. Early testing of the drug found that about half of the test subjects (women recovering from abdominal surgery) reported a full loss of effectiveness before the end of the 12 hours. A later trial on cancer patients had to be redesigned after test subjects dropped out because they found OxyContin to be ineffective in managing their pain. The revised study allowed patients to take supplemental “rescue” medication between their doses of OxyContin. Yet another study on cancer patients found that 95% of those in the test group had resorted to taking a secondary painkiller at some point during the trial. What’s more, the FDA official who led the review of OxyContin left the agency to go work for Purdue shortly after the drug’s 1996 release. In spite of all this early evidence that OxyContin may not be able to live up to its promise of 12-hour relief, Purdue launched the drug with that claim at the heart of its selling points. The state alleges that Purdue’s aggressive marketing — and constant assurances of safety — created a “cadre of doctors” who look for reasons to prescribe opioids, and an “even broader cohort of patients who expected and required” these drugs. In May 2007, Purdue and three of its top executives entered guilty pleas [PDF] for illegally marketing OxyContin as less addictive, and less likely to lead to abuse than other pain medications. That same week, the company reached a $19.5 million settlement with 26 states, closing the book on allegations that Purdue had encouraged doctors to overprescribe Oxy. New Hampshire was not part of that 2007 settlement. In response to these guilty pleas and settlements, Purdue pledged that it would no longer claim OxyContin’s likelihood of abuse is any different from other Schedule II painkillers. However, the New Hampshire lawsuit contends that Purdue has continued to deceptively market OxyContin in the years since. According to the state, Purdue allowed its former misleading claims about OxyContin safety and addiction risks to go unchallenged, and some of these statements remained on company-sponsored websites for years after the company pled guilty to the federal charges. “To convince New Hampshire prescribers and patients that opioids are safe, Purdue has continued to deceptively minimize and fail to disclose the risks of long-term opioid use, particularly the risk of addiction,” claims the lawsuit, arguing that the company’s misrepresentations resulted in the “dangerously misleading impressions” that patients can use opioids without a heightened risk of addiction; that signs of addiction are really signs of undertreatment; that there are tests that can adequately identify patients with a genuine high risk for addiction, but that even these patients could still be treated with opioids; that doctors could continue to increase patients’ opioid dosages without increasing the risk to the patient; and that Purdue’s drugs are less likely to result in addiction than other opioids. The state claims that when Purdue sales reps made sales calls to New Hampshire doctors, they regularly omitted “any discussion of the risk of addiction from long-term use of opioids.” And those reps that did bring up the topic made claims that the state says were debunked in the 2007 DOJ investigation: That the extended-release formulation of OxyContin provides a steady, smooth dose of the medication without “peaks and valleys” associated with other medications. The lawsuit points out that Purdue’s own training documents show that this description of the drug is “problematic,” but contends that the sales force persisted. Purdue also continued to promote, through websites like PartnersInPain.com — which was launched in the lead-up to the launch of OxyContin and taken offline at some point in 2016 — the idea that chronic pain is not being adequately treated. 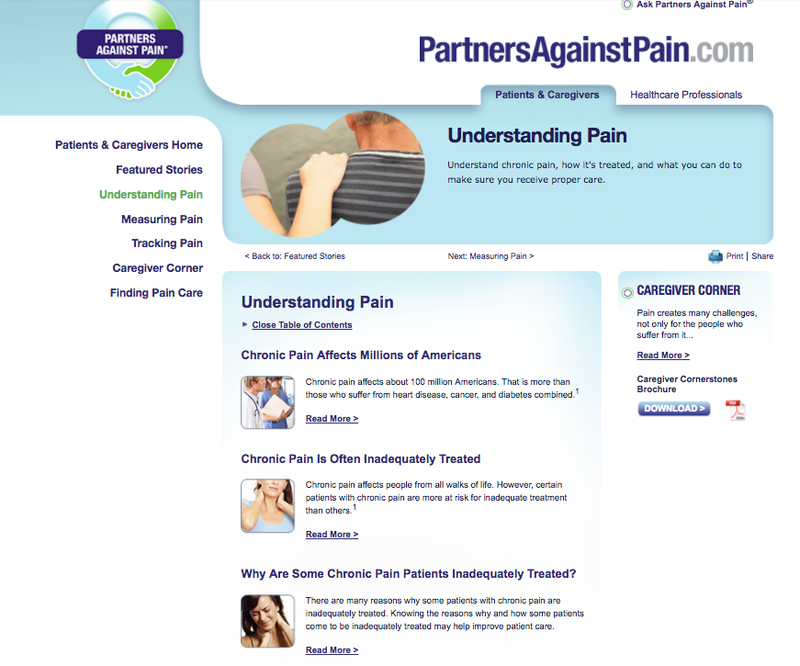 Though described in its literature as “an alliance of patients, caregivers, and healthcare providers dedicated to pain management and advocacy,” the state alleges that Partners In Pain, which only revealed its connection to Purdue in the footer of the website, was really just a way for the drug company to communicate its pseudoaddiction talking points. With regard to the “12-hour” assertion that the state says is still vital to OxyContin’s marketing, the lawsuit argues that just because a drug has been approved for 12-hour dosing doesn’t mean it will actually last that long. To get that 12-hour dosing approval from the FDA, Purdue merely had to show that at least half of the drug trial’s test subjects actually experienced that relief. That means that as many as half the other patients will not experience the full 12 hours. But the state contends that OxyContin’s marketing, and its sales pitches to physicians, plugged the drug as a simple and safe twice-a-day solution for chronic pain. Former sales reps for the company told New Hampshire investigators that physicians complained to Purdue about patients who were not getting the full promised relief from the drug, and that it was a common occurrence for doctors to tell their patients on Oxy to take the drug more frequently than every 12 hours. Rather than change its marketing to reflect that the drug could wear off long before the promised 12 hours, the state says that Purdue instead recommended that doctors increase the dosage amount of OxyContin. That way, the patient gets more of the painkiller, but the drug is still meeting the 12-hour marketing claim. OxyContin’s extended-release structure meant that a single pill contained a large amount of medication that was intended to be doled out over the 12-hour time period. As addiction and abuse of the drug began to take hold, users realized they could easily crush an Oxy pill to get the full dosage immediately, whether it was through ingestion, snorting, or injection. In 2010, Purdue reformulated OxyContin in a more tamper-resistant version, and New Hampshire says that reps for the company sold the “abuse-deterrent” (AD) iteration of the drug using false claims like that it couldn’t be crushed and snorted, or that it actually prevents abuse of Oxy. But New Hampshire points out that this reformulation does nothing to curb abuse from patients who simply take more pills than they should, which is by far the most common form of opioid abuse. For all of its promotion of patient screening, Purdue is allegedly failing to notify law enforcement about doctors and pharmacies whose prescribing and dispensing behaviors send up red flags. While Purdue has insisted that it cuts off relations with these physicians, the state says that doesn’t really matter when those doctors are still allowed to write prescriptions for OxyContin. The New Hampshire lawsuit comes shortly after Ohio filed similar claims against Purdue and several other opioid producers for their alleged mis-marketing of these highly addictive drugs. New Hampshire is far from the only state dealing with high levels of opioid abuse and addiction, but the Granite State was recently thrust into the opioid spotlight by President Trump. According to transcripts of a call with Mexican President Enrique Peña Nieto, Trump declared that “I won New Hampshire because New Hampshire is a drug-infested den,” which was taken as a double insult by some in the state, as Trump actually lost New Hampshire by a narrow margin in the general election.